Based on these and several other observations the authors of the book, Amy Chua and Jed Rubenfeld, move on to analyze what these groups may have in common and sets them apart from the general US population to explain how they are so much more successful. They identify three main pillars of success which all of these groups, according to them, have in common. The superiority complex is being defined in this book as a "deeply internalized belief in your group's specialness, exceptionality, and superiority"(p.8). The examples being discussed are that Mormons and jews instill this kind of feeling within their community based on religious beliefs as "the chosen people" while Cubans, Asians, afro-Americans and Indians seem to emphasize their superiority based on their capability to work harder as anglo-Americans according to the book. This belief has the psychological effect to prime a member of the group to perform better at a certain task because of the belief of being superior (p.22) independently of it being related to sports or academic activities. Therefore the superiority complex is the first pillar of the triple package that is being attributed to success in this book. Insecurity builds the second cornerstone of the triple package. Impulse control is being defined as "the ability to resist the temptation to give up in the face of hardship or quit instead of persevering at a difficult task" (p.10). In the closing chapter, it is pointed out that impulse control might be the most important of the three factors which determine success (p.221). While above average wealth seems to be the positive outcome of the triple package, the book also discusses the other side of the coin. Some children which have been brought up with a triple package mentality feel like they are merely instrumentalised by their parents to full fill their dreams of upward movement in society (p.148). The constant feeling of being not good enough might lead to depression, although the book argues for and against it (American Asians seem to be an exception while individuals with a Jewish background seem more prone to it). Overall this was an interesting read which has been boiled down a lot to make it more digestible for a broader readership. 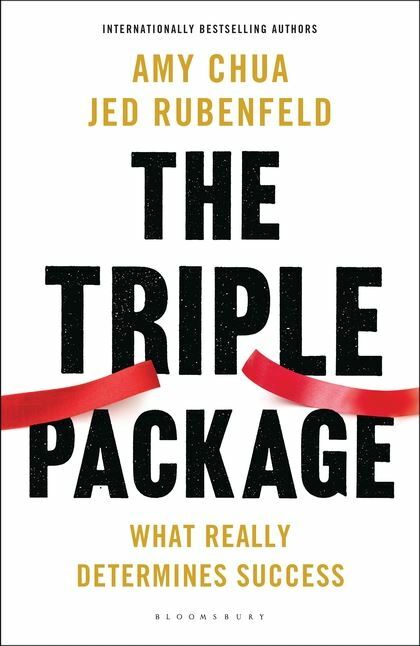 I personally like thick books and would not mind a deeper discussion of the evidence that Chua and Rubenfeld base their statements on and also understand why this might not have a place in a copy which is designed to make the bestseller list. The approach is brave to start from minority groups and look at their overperformance in terms of wealth and then deduct what they might have in common and also what "Americans" might have lost on the way from their founding days until the present day to explain why other nations seem to be on the rise. It leaves the authors open for scrutiny and finger pointing in terms of whether it is a good or bad idea to discuss wealth in conjunction with ethnicities at all. As a European and german I think it would have been even more interesting if this discussion would have been conducted less focused on the aspect of "Why is american wealth declining compared to more successful minorities within america" and more focused on "What can you more successful in any part of the world". In addition I think there is a danger of walking away from this book with the impression that a superiority complex is a good trait to have. German history is mentioned, but I still think that the negative outcomes of superiority complexes could have been discussed in more depth. All in all a good read to remind you, that determination, grit and impulse control are the corner stones of success and that you should never rest on your laurels.